St. Peter walks into a communist vegan restaurant in San Francisco and orders smoked salmon. The hippie at the counter rolls her eyes and says, “we’re vegan. No salmon.” Of course St. Peter is incensed and ready to start brawling: “isn’t this the Pacific northwest? How do you not have salmon?” And just before he lets fly his fists of fury, he looks over and spots Jesus sitting next to Matt Mikalatos. St. Peter’s brow darkens a little farther, and he strides over to confront them. Yep that’s the opening scenario of Matt Mikalatos’ My Imaginary Jesus. 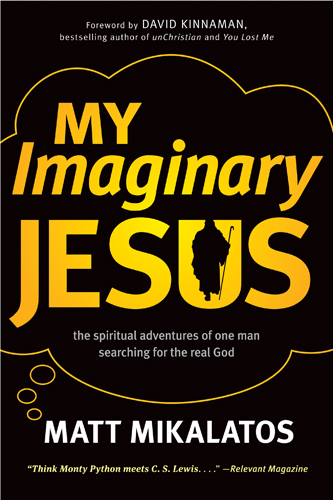 It turns out that Matt’s Jesus was an imaginary Jesus, and with the help of St. Peter, a talking donkey, an ex-prostitute, some Mormon missionaries, and an atheist, Matt goes on a quest to confront his imaginary Jesuses (yes there are many), so he can find the real one. The book was a lot of fun, though I don’t think I’ve been around or cared about church culture enough to get all the jokes. 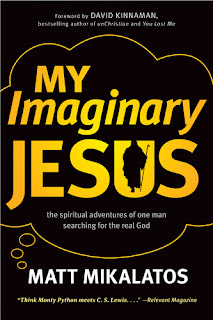 However the point of the book, namely that a lot of the general ideas about Jesus you hear in Sunday School or are taught in seminaries these days are imaginations and interpretations of a real person, is spot on. It’s the real Jesus that we should be seeking relationship with, not the myths we’ve made up over the years. He’s alive and speaking, and we can know Him personally. I highly recommend this book. It will entertain you certainly, but more importantly it will leave you hungry to know the real Jesus and maybe even help you start rooting out the imaginary Jesuses in your life. Hey Stephen -- thanks for the great review. I'm glad you enjoyed My Imaginary Jesus! Thanks Matt! Keep up the great writing! By the by, I have some Campus Crusade friends that really enjoyed your talks at The Big Break this year. Thank you for your service to our Lord! Oh man, my pleasure. I love coming to Big Break.